Unconvinced by heavy hybrid technology, Harris takes a ride in Porsche’s new gasoline-electic supercar and has a word with a Porsche engineer to get a fresh perspective. Rarely does Harris review a car from the passenger&apos;s seat, but for the ingenious Porsche 918 Spyder he made a wise exception. While posting a blisterng 7:14 lap time at the Nurburgring, Porsche invited Monkey to take a spin on the road riding shotgun in the 918 Spyder. After experiencing the eerie silence of the electric powertrain and the full force of race mode, which combines the conventional and electric motors for maximum thrust, he has a chat with a Porsche engineer. They discuss the phenomenally complication chassis calibration and other interesting areas of Porsche&apos;s latest technological showpiece, which packs a 4.6-liter V8 coupled to a pair of electric motors to deliver over 770 horsepower and 553 lb-ft of torque. 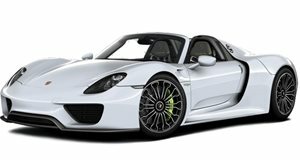 Porsche predicts a 0-60 mph time of less than 3 seconds and a top speed of over 202 mph, with fuel consumption forecasted at 78 mpg. Variable aerodynamics, adaptive rear-axle steering and an upwards-exiting exhaust system are also part of the package. The 918 Spyder is set to enter production in September 2013. Only 918 examples are scheduled to be built, all of which have reportedly been pre-sold for 645,000 Euros apiece.